Waterfall taps add a cool, contemporary touch to a modern bathroom and can be fitted to basins, baths or wall mounted. Take a look at our carefully selected range of waterfall basin taps and bath fillers below. 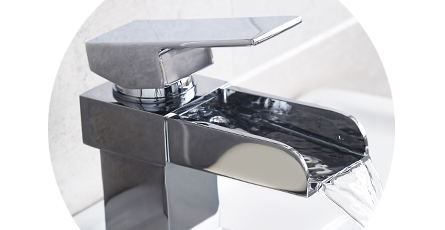 Styled in a chrome finish, waterfall taps provide an elegant and trendy look with their half-pipe style spout which produces an effortless waterfall effect. Wall mounted waterfall taps require slightly more effort for installation but they're a feature which really adds that wow factor! These unique bath taps and basin taps add a touch of modern class to bathrooms, cloakrooms and en suites. Their solid build is backed by long guarantees making them exceptional value for money! "The tap arrived very promptly. Was well packaged and looks to be good quality, though not yet fitted." Lovely little tap and easy to install.